Amazons-fierce warrior women dwelling on the fringes of the known world-were the mythic archenemies of the ancient Greeks. Heracles and Achilles displayed their valor in duels with Amazon queens, and the Athenians reveled in their victory over a powerful Amazon army. In historical times, Cyrus of Persia, Alexander the Great, and the Roman general Pompey tangled with Amazons.But just who were these bold barbarian archers on horseback who gloried in fighting, hunting, and sexual freedom? Were Amazons real? 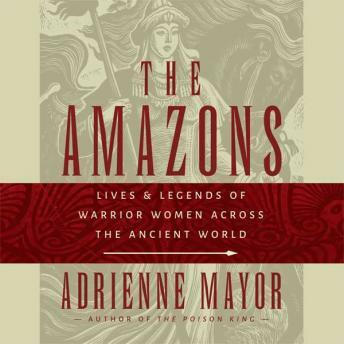 In this deeply researched and wide-ranging audiobook, National Book Award finalist Adrienne Mayor presents the first comprehensive account of warrior women in myth and history across the ancient world, from the Mediterranean Sea to the Great Wall of China.Combining classical myth and art, nomad traditions, and scientific archaeology, she reveals surprising details and original insights about the lives and legends of the women known as Amazons.